As a writer of romance, I know that the character is everything. They are the ones we read for. They are the ones whose goals and determination drive my stories forward. They are the be all and end all of my books. Yes, I love the plots—what happens in my stories—and my critique partners are always telling me that I spend way too much time crafting my plot and working the mystery or fight scene or the magic, depending on the book. But I’m slowly changing over from a “what happens next” sort of writer to a “what has to happen to force my protagonist to grow and learn” sort of writer. I’m moving from worrying about the plot to worrying about the characters. And that’s kind of funny because a lot of the reviews I’ve gotten for my book have commented on how real-to-life my characters are, so I guess I was doing something right. But I want it to be better. In order to get better at characters, I’ve got to understand the people I’m writing about. I need to know where they came from, what’s important to them, and how they see the world. I have to be able to look at the world through their eyes and think like them in order to write from within their head. In short, I need to conduct character interviews. I’m also learning that these interviews might be of interest to readers (if you’re a reader, please tell me if I’m right in the comments below!). I honestly hadn’t thought about it before, but as a reader, I think I’d want to know all this stuff about the people I’m reading about too. I become friends with people in books—both the ones I write and the ones I read. So, naturally, I’m interested in their earlier life. In their family. In why they despise the color yellow, if they do. The funny thing is, I rarely conduct character interviews. I think deeply about the characters I write, but then I fill out a worksheet detailing their goals, why they have them and what is stopping them from achieving their goals. I have a very pretty worksheet filled with little boxes: strength, weakness, deep dark secret, special abilities, worst fear, etc. (if you’re a writer and you want a copy, just slip over to my website For Writers section. You’ll find this one among many others). But now, I’ve been asked to write up character interviews to be posted on blogs and I’m wondering what I should ask my characters. What do you think? What would interest you in a character interview? What would you like to learn about the characters you read about? 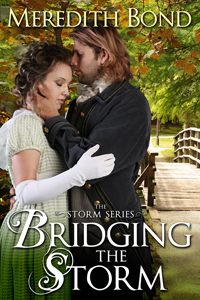 My Regency-set fantasy romance, Bridging the Storm (for which I need to write these interviews), is available wherever you buy books: From the mists of legend to the estates of the Regency, independent-minded Kate and the knight Sir Arthur Dagonet tussle with a force unanticipated by either, and stronger than any desire for life or death—love. And the prequel novella, Storm on the Horizon is free everywhere. Highland Games: Research and Kilts!